• Shaukat Tarin delayed and will now be appearing at the conclusion. • It will be the first time he will be appearing as the finance minister. • Cyril Nigel won’t be here either as her father is critically ill and she went back to be with him. 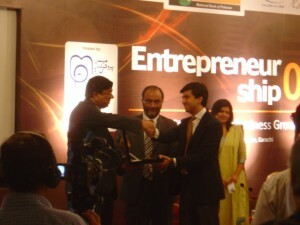 • Memon community has been at the forefront of entrepreneurship in Pakistan. • Adamjees, Bawas, Bundukdas are some of the stalwarts. • At the time of creation, the Memon community took the most entrepreneurial initiatives. 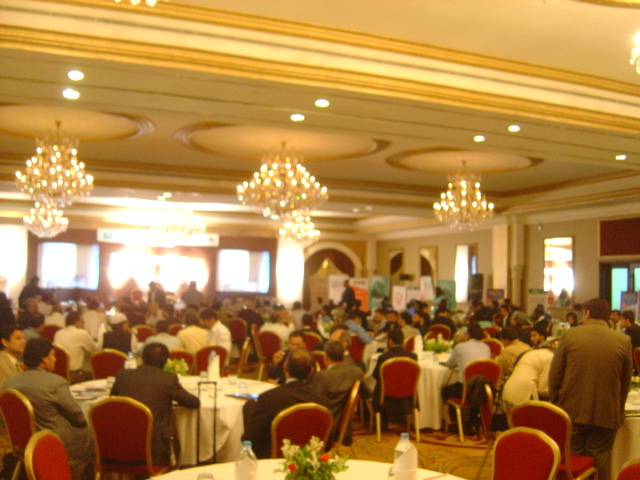 • Memon Professional Forum (MPF) started in 1985, grew from a handful of members to hundreds. • MPF comprises of veteran entrepreneurs, professionals serving in major organizations as well as young professionals just starting out. • Forum offers financial assistance to the deserving candidates of the community in addition to other philanthropic work. • Entrepreneurship is the practice of starting new business from scratch. ‘It is the art of taking risks’. • Who exactly are entrepreneurs? • Are they just robber barons or do they fulfill a vital need of the society? • No country values its entrepreneurs more than America does. • Stanford University did a global research over a period of 10 years searching for the elusive factors that make entrepreneurs successful irrespective of their geographical position. • What they discovered was contrary to what I’ve just told you about entrepreneurship – great idea propagated by a charismatic leader. Successful enterprises were in fact headed by ordinary people with little or no charisma but good people skills and humble beginning. • Research has shown that in the long run, high profile charismatic leader is a liability. • Other vital factors – a dream and a passion for what you’re creating, faith in Almighty and yourself and persistence. • I haven’t met a single entrepreneur who didn’t face hardships – cash flow problems, shrinking market etc. • What’s your reason for being an entrepreneur? • Is it to become wealthy, famous, enhance the reputation of your family or create an impact in the society? • These questions are the essence of entrepreneurship. Think about them long and hard. • It’s a long iterative process and there’s no right or wrong answer to it. What you feel at the bottom of your heart is your answer. • Do you want to be a clock-builder or time-teller? • Clock-building is a painstaking long process – with inch-by-inch progress but the dividends are great. 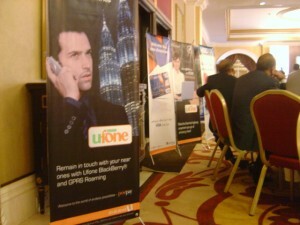 • Pakistanis have the tendency to be in this business and that business. They feel they can make anything turn to gold with their touch. They lack consistency. • Stay in your core competence. Only those companies become and remain successful which stick to their core competence. • Problem with Pakistanis- they think the whole world is confined to Pakistan alone. Fail to see beyond. 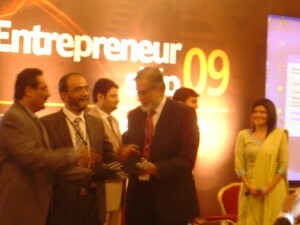 • Being a Memon, I would like to say they’re hard-working and really competent at entrepreneurship. • However, they have to think beyond exports and build institutions instead of just making money. • There are hundreds of entrepreneurs around the world who made it but only a few who actually built institutions. • Dwelled at length about Pakistan’s poor ranking in various categories of Doing Business Survey 2009 conducted by the World Bank. o Pakistan ranks 77th in ease of doing business. o 101 out of 134 countries in credit ratings. • 30 years ago a man who was already well-settled in his business came up with the idea of creating a company with engineering competence that could compete globally. Didn’t pay much heed to it especially since there were many technically superior companies in the global market. And yet this man persevered and made his mark on the global scene with his company. 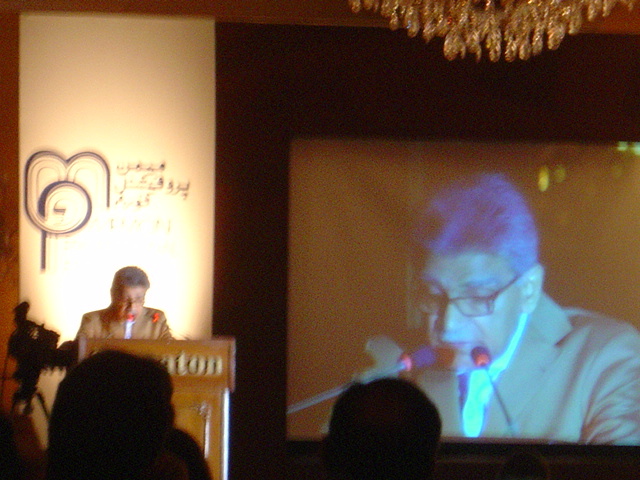 That man was Razzak Dawood and the company Descon. • Economic Tsunami – globalization. • Five key enablers : concept of a company citizen as opposed to a country citizen, creating and leveraging skills, innovation and creativity, service-oriented culture. • Pakistanis fragmented and divided – individually brilliant but put them together in a room for a few minutes and they’ll explode. • Indians take any job, Pakistanis want ‘The’ job with a good title. • Why Shezan, Quice and Salt n Pepper did not become global brands? • Couldn’t BBQ Tonight create more than one branch in the entire city of Karachi or go to Lahore? • Now we have foreign brands like Makro, Metro and now Carrefour trying to cash in on the void which could have been filled by the local brands easily if only they tried. • This is because we lack patience and do not like relinquishing control. 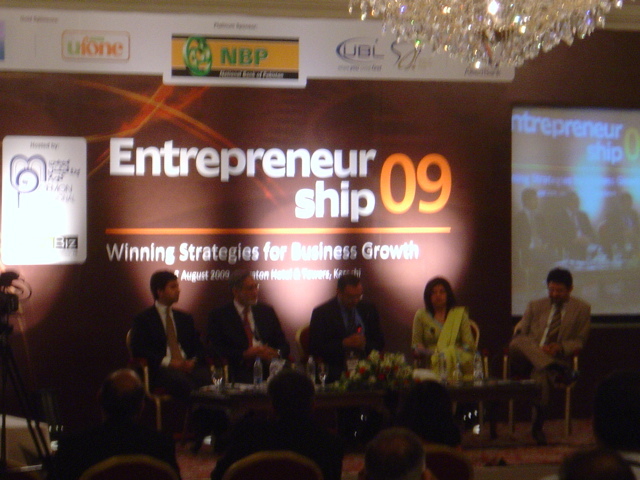 • Pakistani entrepreneurs have merely built mortars and bricks not institutions. • Where are the Pakistani equivalents of Tatas, Mittals and Ambanis? • Shops from G.T Road to Sialkot and Nishter Road in Karach are brilliant at creating copies of anything under the sun. • Corporate America pumps billions of dollars into Research & Development. • 200 universities in India have produced 5,000 Ph.Ds. • India’s I.T industry revenue is equal to half of Pakistan’s GDP. • Large chunk of money is funneled into creating television channels in Pakistan which do not create any real value. 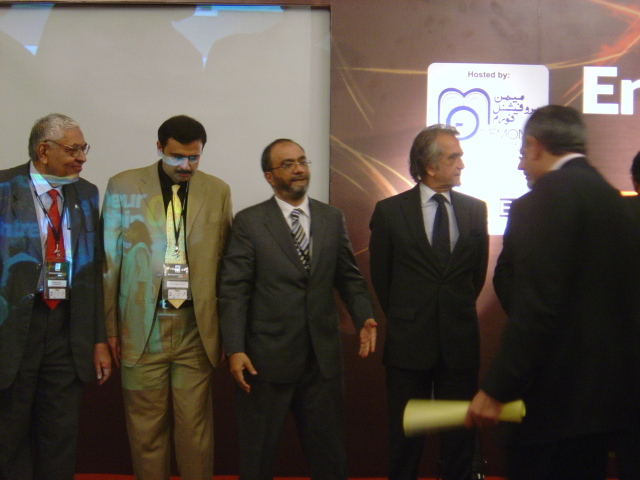 • Ideas 2008 exhibition was all about Defence as will be Ideas 2009. Where is the Ideas exhibition for electronics, mechanics and so on? • Pakistanis feel shame in showing hospitality in public. • How many GMs have been produced by the hospitality industry? 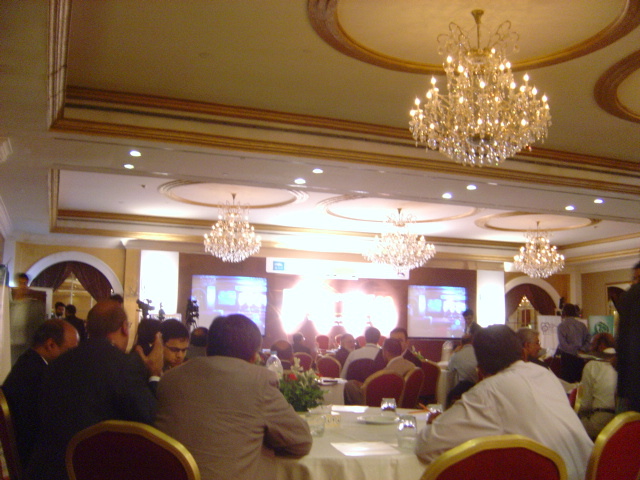 • Why there is no MBA in hotel management in Pakistan? • Restaurateurs are looked down upon. • Only two prominent restaurateurs – Rafiq Rangoonwala and myself. 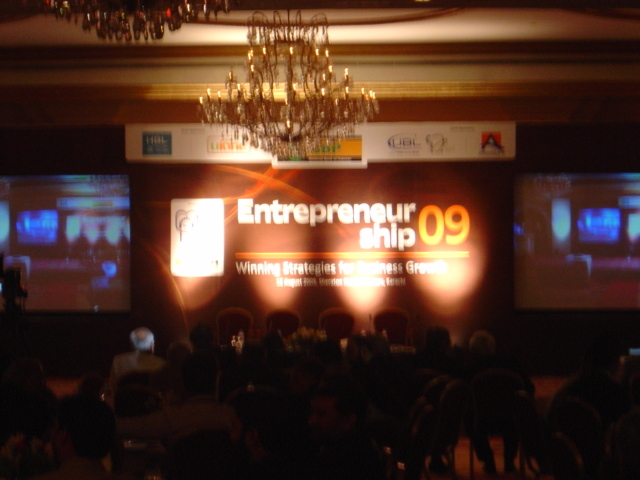 • How many Pakistani entrepreneurs built brands that lasted on the global scene? Descon is the exception. • Who’s running Dubai? Lala’s from our neighboring country. • World Quality Basmati Rice are imported by India from Pakistan and sold with Indian brand names in the Middle East market. • Apart from the financial sector in which Pakistanis still hold sway in the Middle East market – 9 out of 10 people have accounts in UBL – Pakistanis have eroded their value in all other sectors. • Life has dealt its hand- you have to face the challenge yourself – no Messiah will come, no apple will fall for another Newton. • A nation of 170 million gifted souls. 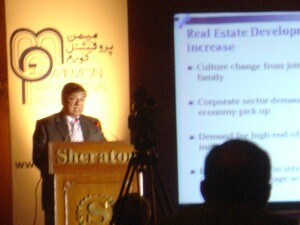 Arif Habib – Investment Opportunities in Pakistan. • Entrepreneurship is Ibadat, more nobel than charity because it provides earning opportunities to people. • Sixth most populous country. • Property tax on rental property reduced from 25% to 5%. • 5% tax incentive for builders. • Capital gain tax exemption if property sold to REIT. • Yield per acre in Pakistan way less than the other countries including Egypt. • Demand to grow CAGR 7.8% for five years. • By 2016 demand would have ballooned to 28GW. • Fertlizer – Export Potential – Existing Markets – 10 million tons including Middle East and South Asia. • Finance – privatized in 1989. • Wages in finance sector in Pakistan 2nd lowest in the region at 35 cents, India 47.3 cents, China 69.5 cents, Sri Lanka 44 cents and Bangladesh lowest at 27 cents. • Office rent in India is highest in the region at $100 per sq.ft. • Pakistan thus economically viable for setting up business. • Only 15% of family owned enterprises continue to succeed to the third generation. • 85% disintegrate before the 3rd generation takes to the reins. • This was the result of a survey conducted by the consultant Mckinsey. • Share of all the family member should be equitable – not equal to ward off disputes. • Family enterprises should build the business as institutions not family-owned business that dies with the family or the head of the family. • Unity in family should be ensured. • Brand-building ought to be a regular and ongoing pursuit. • An incompetent manager belonging to the family should not be preferred over competent non-family manager. • U.N Entrepreneur Award once went to an illiterate 50-year old Pakistani woman. • She sold two baskets of eggs every day to make a living. Then she took Rs. 15,000 loan and bought bicycles which she asked her alcoholic husband to give on rent. She invested the rent in installing baskets on the bicycles, gave half an hour extra to her tenants in return for carrying her eggs to the market. This way she was able to increase her sales from two baskets per day to an average of eight baskets. In this way she went on expanding her business. • When I went to Hong Kong for my first job, the cab driver I hired to take from the airport to the city kept shooting questions at me. He wanted me to rent an apartment from him. When asked why me, he said you’ll be pay on time because you were a banker. 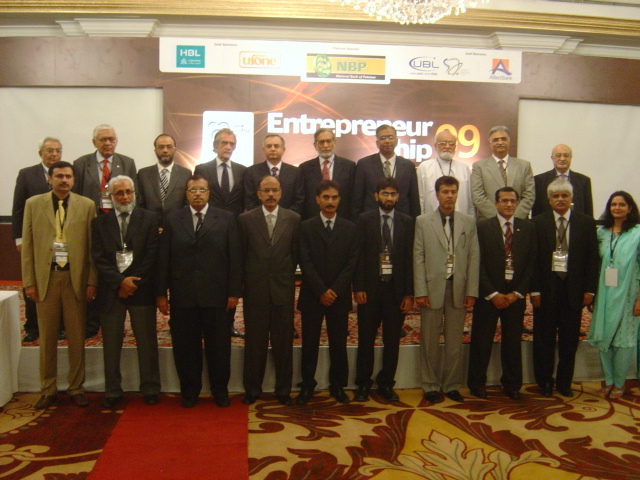 • Business education passed down from father to son and so on is a tradition in Pakistan. • On a trip to Pepsi factory as a schoolboy, one striking observation was that the children who belonged to a business dynasty had a remarkable idea intuitively about the layout of the factory and what different processes were being run there as opposed to children from working class families. • This is an inherent advantage that offspring of business tycoons have and it cannot be acquired any other way. • Pakistan’s history is awash with dynasties in all arenas. In politics we have the Bhuttos, the Sharifs and the Legharis. In sports we have the Khans and so on. • Ours is a relationship-based society instead of a rule-based society. Most of the major business decisions are based on relationships. • The fact that we have so many family-owned enterprises in Pakistan shows there’s a need for them. In some way they are filling a void. • Moral Hazard – The manager does not put in as much effort as the owner would because he’s not been given an equitable share of the fruits of his labor. • Pakistani enterprises tend to shy away from sharing ownership of the business with their employees like offering them stock options. • Misconceptions abound about the leadership in the family-owned enterprises. • Pressure on her being a fourth generation to emulate the stellar performance of the previous generations. Moderator Q: How do family-owned enterprises deal with the issue of involvement of family members in the business? Miftah Ismail: They don’t. All family member have to be accomodated into the business one way or the other. Most of them are inducted as heads of departments and sometimes they are not the best capable people for that job. I myself was straight away given the entire charge of the marketing department and took a while getting the grips of it. Businesses that recruit family members at key positions without merit can’t compete with the like of MNCs or even local capable companies because they’ve got the capable people at the right positions. Ali Jehangir: There’s a sense of entitlement inculcated into the offspring right from the outset by the mother that when you grow up you have to go work at your dad’s place. Moin Fudda: Arif Habib was observed once to have made five decisions just like that in half an hour. He was able to do that because of the wisdom he has acquired over all these years. Moderator Q: Can unresolved conflict lead to disintegration of the enterprise? Ibrahim Qassim: Yes, it can. That’s why any conflict should be nipped in the bud. Problems never go away with time. Moderator Q: How do comparisons between different family members affect the unity of the enterprise? Mahwish Tapal: My father didn’t have any brother, so my mother didn’t get to compare her assets with that of her counterparts, so no chance of a conflict arose. • On my very first day, my dad said that I hate the word ‘Seth’. You’re going to start at the bottom of the ladder just like everyone else and build your reputation from there. • My father hired a lot of young graduates at the outset to help him along and imparted his skill and knowledge to them. People told him to refrain from doing so because these same people will become his competition in the future. • He didn’t listen to these people and treated these young employees as his companions. Today they are still with Tapal, having gone on to become heads of their departments. Audience Q: How do business families save their members from getting corrupted by the wealth? Ali Jehangir: Different families come up with different solutions to this problem. There’s this famous Swedish family which has restricted access to the dividends of the stocks owned by the offspring. Although the offspring have ownership of the stock, it’s extremely difficult for the m to even sell any of their stock. Miftah Ismail: One way to go about it is to create small businesses and give them to the nieces and nephews to run instead of taking them on board the core business. It would also test their entrepreneurial skills without hurting the cash cow. Audience Q: Being a woman and on top of that the daughter of the owner, how do you deal with man who’re working under you? Are they resentful of you? Do they think you’re just their because of your dad and not deserving of the position you have in the organization? Mahwish Tapal: I’ve been working for three years now, and initially it was quite difficult for me to justify my position. For the first two years I had to really work hard to building my reputation as a separate individual who has her own capabilities and that when she voices her opinion, it has to be taken in that context and not in the context of she’s the boss’ daughter.